The linesman raises his flag for offside before Hernan Perez (Espanyol) heads on. Oscar Duarte (Espanyol) scores an unfortunate own goal and the opposition increase their lead! We are about to witness a substitution. Javi Garcia (Betis) is replacing Joaquin. Pablo Piatti (Espanyol) is flagged for offside. Cristian Tello (Betis) unleashes a beautiful rocket of a shot from a long-range free kick. The ball goes into the top left corner and leaves the goalkeeper beaten. This takes hours and hours on the training ground. The score is 1:2. The sound of the whistle has almost been drowned out in the deafening atmosphere of this match. Cristian Tello (Betis) is setting the ball up for a free kick from mid-range. Gomez Victor (Espanyol) has tested the patience of referee Jose Sanchez and goes into the book for a previous late challenge. Betis didn't take advantage of the corner and score as the opposition's defence was alert and averted the threat. Antonio Sanabria (Betis) attempts a long crossfield pass, but the defence does well to intercept the ball. Sidnei (Betis) rises above the defence to meet the corner. His timing is good, but he arrows his header just a few inches wide of the right post. Antonio Sanabria (Betis) attempts to find one of his teammates with a fine lofted pass, but the defence reacts well to intercept the effort. Substitution. 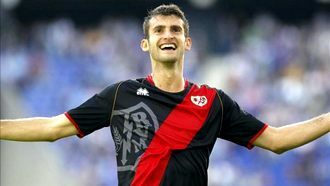 Leo Baptistao is replaced by Pablo Piatti (Espanyol). Sergio Canales (Betis) unleashes a shot, but his effort is poor and floats high over the bar. Sergio Canales (Betis) sends a long ball in, but Diego Lopez comfortably gathers the ball. Referee Jose Sanchez gets a signal in his ear and goes over to the VAR monitor to check whether it’s a penalty! The resulting set piece from Betis is comfortably intercepted by one of the defending players. Quique Setien has decided to make a change. Antonio Sanabria (Betis) replaces Loren. The free kick is taken by Sergio Canales (Betis), but ball is cleared. Oscar Duarte (Espanyol) robs an opponent of the ball and explodes in anger when Jose Sanchez blows for a foul. The substitution is prepared. Sergi Darder (Espanyol) joins the action as a substitute, replacing Esteban Granero. Ambitious effort from Loren (Betis). He finds himself in a great position after collecting a precise pass inside the penalty area and goes for goal, but it never troubles the goalkeeper and flies well wide of the left post. A fine solo run by Adria Giner Pedrosa (Espanyol) takes him deep into the box, but it comes to nothing as his shot flies well wide of the right post. Leo Baptistao (Espanyol) is asking for medical treatment after picking up an injury. This yellow card was deserved. The tackle by Sidnei (Betis) was quite harsh and Jose Sanchez didn't hesitate to show him a yellow card. Nice individual effort by Francis Guerrero (Betis). He gets all the way to the goalkeeper, produces a strike towards the right side of the target, but Diego Lopez does a good job to anticipate the direction of the ball and keeps it out with a save. Betis are dominating the game at the moment by exchanging a combination of one or two touch passes. Great harmony between the players. A pass by Hernan Perez (Espanyol) ends up in no man's land, and the attacking effort comes to an end. An accurate pass to the edge of the box is well taken by Giovani Lo Celso (Betis), whose instinctive shot towards goal flashes inches over the top. David Lopez (Espanyol) sees a yellow card from Jose Sanchez after he sent one of the opposing players to the ground. Joan Rubi decides to make a substitution. Borja Iglesias will be replaced by Hernan Perez (Espanyol). Esteban Granero (Espanyol) tries a pot shot from the edge of the box, but it goes narrowly wide of the left post. Borja Iglesias (Espanyol) sends a lofted cross into the box which is headed clear. Aissa Mandi (Betis) gets a yellow card. William Carvalho (Betis) doesn't hesitate and begins a run towards the opponent's goal. Defenders try to tackle him, but he manages to keep the ball at his feet and pulls the trigger in front of the goal. The strike, though, was not as successful as the solo run and the ball is easily stopped by the keeper. Leo Baptistao (Espanyol) produces a quality cross into the box, but the opposition's defence intercepts the ball and spanks it away. Leo Baptistao (Espanyol) drives a shot towards the bottom right corner from inside the box, but Pau Lopez leaps like a salmon and knocks the ball away. There will be nothing more to see in the first half. The whistle blowing of Jose Sanchez has ended it. Jose Sanchez shows a yellow card to Borja Iglesias (Espanyol), who isn't surprised as the tackle was really hard and late. Sergio Canales feeds the ball through to Giovani Lo Celso (Betis), who picks up the pass inside the box and quickly sends it into the middle of the goal! The goalkeeper was helpless. 1:1! The manager makes a subsitution with Cristian Tello (Betis) coming on for Firpo Junior. A raking crossfield pass from Marc Bartra (Betis) lacks accuracy and the opposition gain possession. Firpo Junior (Betis) is having a really tough time right now. We are about to find out how serious his injury is. Referee Jose Sanchez sees the trip by Joaquin (Betis) and doesn't hesitate to blow his whistle. Leo Baptistao (Espanyol) is adjudged to have been offside when making his run. Firpo Junior (Betis) fails to pick a body out in the box with an over-hit chip pass. Rough tackle by Borja Iglesias (Espanyol). The referee blows his whistle for a foul. Borja Iglesias (Espanyol) smashes a shot at goal from the edge of the area that drifts harmlessly past the right post. The ball goes out of play and Betis will have a goal kick. Borja Iglesias (Espanyol) was too forceful with his tackle and Jose Sanchez interrupted the game to signal a free kick. Goal! A precise cut back on the goal line from Leo Baptistao finds Sergio Garcia (Espanyol) right in front of goal, and he easily buries the ball low into the middle of the goal. 1:0. Jose Sanchez shows a yellow card to William Carvalho (Betis) for a tough tackle. Joaquin (Betis) sees a yellow card. He should be more careful because one more challenge like that could result in a red card. Loren (Betis) gets inside the box and tries to beat Diego Lopez with a measured shot into the right side of the goal, but the keeper is equal to the effort and makes a fine save. Giovani Lo Celso (Betis) doesn't take advantage of the chance to score from the penalty spot. He shoots to the bottom right corner, but Diego Lopez leaps out to thwart his effort. Roberto Rosales (Espanyol) carelessly slides into the feet of his opponent and he'll be lucky to avoid punishment. Jose Sanchez blows for the foul but keeps his cards in his pocket on this occasion. PENALTY to Betis! Great chance to score. Joaquin (Betis) takes the corner, but it's intercepted by the defender. Sergio Canales (Betis) fires the ball at goal from inside the area, but it's well blocked. Jose Sanchez blows for a foul after Firpo Junior (Betis) was too aggressive in the battle for the ball. Borja Iglesias (Espanyol) makes his forward run a little too early and is caught in an offside position after his teammate tries to play a pass to him. The linesman raises his flag. Loren (Betis) is adjudged offside. Francis Guerrero (Betis) fails to find a teammate across the pitch with a long ball. Jose Sanchez blows his whistle. Leo Baptistao (Espanyol) commits a foul after dangerous play. Sergio Garcia (Espanyol) wastes a big opportunity! He controls the ball after a nice low pass and shoots from a promising distance. His poor effort goes miles wide of the right post. A crossfield pass from William Carvalho (Betis) fails to find any of his teammates. The players are on the pitch and Espanyol will have the kick-off. Jose Sanchez will referee today's match.